“It was the best of times, it was the worst of times.” For the Burgundy lovers who descended upon San Francisco last weekend it was definitely the best of times in the epic novel sense. Daniel Johannes’ La Paulee (lapaulee.com) simply rocked with star power and incredible wines. Most striking was the volume of quality both the people and what was being poured. Raj Parr had already been orchestrating some of the VIP events before the ‘big night’ and overhearing the descriptions of some late night wine list pillaging left me breathless. Romanee Conti was apparently on tap at Michael Mina last week and if you were looking for something other than Burgundy you would have to suffer through some mind blowing selections (1961 Krug anyone?). Of these wines there were some affirmations and revelations. First of all what good timing with having all those 2005's hitting our shore. Fourrier’s Clos St. Jacques was benchmark 2005 Burgundy, as were the selections from Rousseau such as his Charmes –Chambertin and Chambertin 2005. Grivot, Mugnier, Lafon, Jobard, and Roumier were also expectedly in prime form. My surprise was Domaine David Duband, a producer I was not familiar with until the event. The wines were outrageously good especially considering they were 2006 and not 2005 like most of the other producers (the exception being the Nuits-Saint-Georges 1er Cru Les Pruliers). I had several people comment positively on the wines and especially their price point. Kudos goes to Jesse Rodriguez of The Grand Del Mar for pointing it out this producer. A complete value! 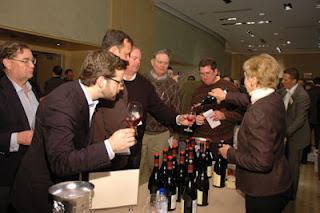 So many top sommeliers were pouring it seemed everywhere you turned there was another familiar face. Eugenio Jardim of Jardiniere commented that it was like a high school reunion, everyone you wanted to see and everyone you didn’t want to see all in one place! Of course he was joking about the last part ;) . I think there were more Master Sommeliers under the same roof at that moment than anywhere else in the world, including a new one, Emily Wines of the Fifth Floor. What an accomplishment! I remember tasting with Emily when she was cramming for the Advanced and that seemed like a feat back then. Another round to hit some of our favorite producers and then it was expresso and exit time. After a three hour interlude we came back for a dinner the likes of which I had not experienced before. Waiting outside I saw a line of sommeliers funneling through, including Richard Betts (The Little Nell) and Larry Stone (Rubicon). Then the collectors hauling cases of precious Burgundy. Wilf Yeager was there and Eric Greenberg pulled up to a group of fellow collectors whose first question was, “anything good in the box?” Oh, the usual, like La Tache 1979 in large format.